shadows of the past and grim haruspex which triggers first? Love the deck - been wanting to make a similar one for a while. accordianing suggestions to avoid filling the page. Origin Spellbomb - double dips as part of "Lay me Down to Rest" here, allowing extra card draw for token generation. Roc Egg - double dips as well, making multiple 3/3 flying tokens when it dies with your general on the field. Sorin, Lord of Innistrad - pumps out lifelinkers, pumps out emblems. double win. Pitiless Plunderer - gives treasure tokens on you creature's death. Hidden Stockpile - a sac outlet that grants creatures. Elspeth, Sun's Champion - pumps out tokens 3 at a time, or wide down the fatties. or both. Twilight Drover - make tokens when tokens die. the cycle continues. Custodi Soulbinders - makes tokens based on how many creatures were in play. White Sun's Zenith - EoT mana dump for all the tokens. follow up with general cast, swing. Entrapment Maneuver - force a solo attacker to die, makes tokens. handy little overlooked combat trick. 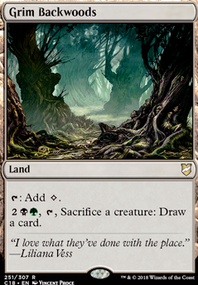 Legion's Landing Flip - makes a single token for 1. lingers a bit, then turns into a land that makes tokens. Lingering Souls - kind of a staple of Orzhov spirits, was kinda supprised not to see it. Luminarch Ascension - stall to make stupidly cheap angels. Massacre Wurm - each creature of theirs that dies will take another nibble out of their health. it all adds up. Sangromancer - death is life. who knew? Pious Evangel Flip doesn't look it, but his flip is another Zulaport Cutthroat for your deck. Bloodchief Ascension starts out small, but starts draining hard once it gets rolling. Martyr's Bond is Butcher of Malakir for ALL permanent types you control. gravepact and / or Dictate of Erebos act as non-wrathable butchers as well. Vampiric Rites is a solid, cheap card draw engine for tokens. Perilous Myr - can be a decent source of colorless burn as needed, when paired with a good reanimation engine. Seraph of the Scales - this card is solid, if not amazing, so I was rather suprised to not see it here. Yosei, the Morning Star - either lock down 2 opponents for a turn, or one opponenet for 2 turns. either way is a solid win. Archon of Justice - exile a threat on death. simple enough. Ashen Rider - triggers coming and going, but kinda pricey mana wise. worth looking at if nothing else. Kokusho, the Evening Star - drain ALL THE THINGS! Solemn Simulacrum - goes in most decks, didn't see it here so I figured I'd mention it. Vindictive Lich - gives alot of options for a single death effect. Raikas Yeah Demon of Dark Schemes seems very powerful. I'll have to test it, and I'll definitely put it in the maybeboard. It is very slow but acts as a boardwipe on its own. Once its engine gets online it might pull off a win similar to the Reassembling Skeleton line. I don't play Shadows of the Past for the same reason I don't play Ashes of the Abhorrent . Scrying is better than not, but I want to use my card slots for things with higher impact like engine pieces or very good utility. I should put the card in the maybeboard though, you're right about that. h0ly_danc3r I've never had problems so far with lacking win-cons. If you think you need more, these buff cards would be fine includes, but currently I'd rather have more engine pieces. Yahenni is good because he doubles as a threat, but I like cheaper sac outlets. If you need more card draw, Mind's Eye is alright, but this deck can achieve so much more with its plentiful options. 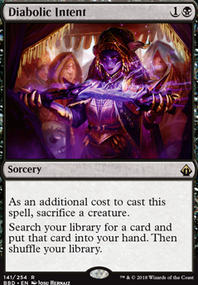 I would rather play cards like Stoneforge Mystic , Open the Armory , or Beseech the Queen to tutor for Skullclamp if I need more card draw. Otherwise Necrologia , Mentor of the Meek , and Corpse Augur are all great ways to draw massive amounts f cards for less mana than mind's eye. Mycosynth Lattice with Marionette Master looks janky and fun. Demon of Dark Schemes Is insane. After playing with it in my brew for a few days, it has shown itself to be a huge combo piece. 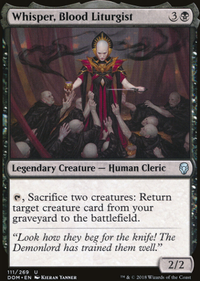 Sacrificing any 2 of our creatures gives us the energy to activate, and if we have Pitiless Plunderer Phyrexian Altar Ashnod's Altar Pawn of Ulamog or Sifter of Skulls out, we can pretty much go infinite or abuse resurection for 1black until we run out of mana. Most of the time we won't though. 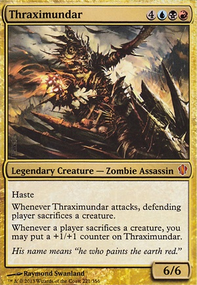 If Treasure Keeper is the creature we are sac cycling, things get degenerate. He's also a decent board clear. Also I don't see Shadows of the Past in the maybe board or main. Any creature, scry twice, 2 mana. suarkdivad: I don't think Lifeline works that way, especially since it does specify YOUR graveyard. For your opponents to take advantage of the trigger there should be written "of that player's graveyard" or something like this, shouldn't there? That's at least to my understanding of the rules. Still it might be well substituted by either Reveillark or Karmic Guide . 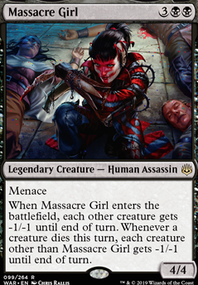 I'm very hesitant on cutting Shadows of the Past because it is one of the few cards in here that grant you card advantage. I will look for another targets to cut and if I find something I'll make sure to put Reveillark and Karmic Guide in. Thanks for the suggestion! Could probably cut Lifeline and Shadows of the Past . 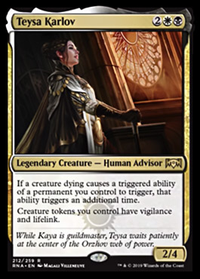 I can't see how lifeline can take advantage of Teysa's trigger since it specifies "that creature" and is at end of turn... and it also works for all your opponents' creatures which they sometimes might be able to take better advantage of than you. Shadows gives you 2 scry triggers if Teysa is out, which is good, but not the strongest card in your deck. 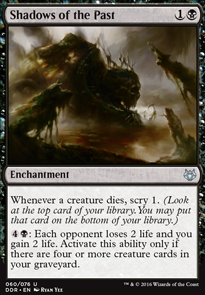 The second half of the card seems slow, though Orzhov likes slow and grindy. Anyways, those are the two I'd cut! Have fun with the deck.